Bird lovers, let’s hear it for the little guy. Researchers have just discovered evidence that common swifts (a small type of bird) can spend 10 continuous months per year in the air without landing—a world record for sustained flight in nature. The birds are extremely common in Europe, where they land for two months to breed, spending nights roosting in the nests they build themselves. After breeding, they fly off to Africa, where no one has ever discovered roosting areas, and now we finally know why. 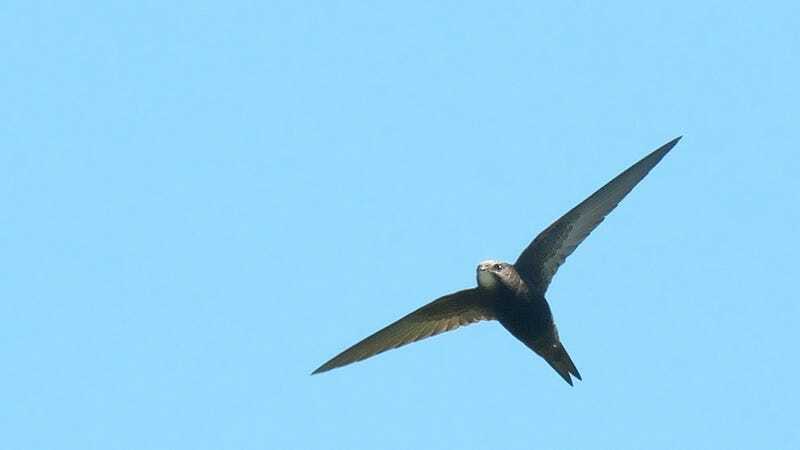 Biologists at the University of Lund, led by Anders Hedenström, made the discovery that common swifts are able to stay aloft for at least 10 months by capturing some in southern Sweden, where they nest, and attaching micro-data loggers onto the birds. The team of researchers has reported their findings in Current Biology. The research was enabled by new miniature electronics that allow scientists to track smaller creatures. The devices themselves weigh less than four hundredths of an ounce, so animals like swifts, which weigh about one and a half ounces, are able to carry them without any issues. The crazy part is we still don’t fully understand how they sleep. If you assume that like every other animal on the planet swift’s require some sleep, then logically, scientists have concluded, they must sleep while in the air. One possible way they’d be able to do this is like dolphins, who are able to turn off parts of their brain to “sleep” while their bodies remain active. There’s also a very slim chance any animal will ever be discovered that flies longer than the common swift. Currently, the second longest flight of any animals belongs to the alpine swift, which flies for six months at a time and is a different species of swift that migrates much farther south in Africa. So let’s all raise a glass to the often overlooked, but super capable common swift. It’s tiny little body and wings make it one of the best fliers in the world, and we love it.